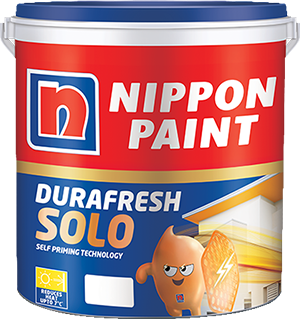 NIPPON PAINT DURAFRESH SOLO is a specially formulated Self Priming Exterior Emulsion paint having systematic UV crosslinking mechanism exhibiting Excellent balance of flexibility and dirt pick-up resistance. It exhibits Heat Ban technology which reduces surface temperature by up to 7°C. It imparts a rich sheen finish and has anti-algal resistance to keep your walls fresh for longer time. 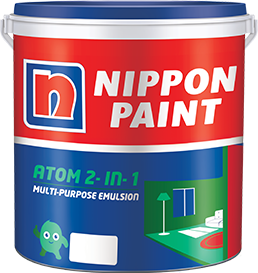 NIPPON PAINT WEATHERBOND PRO is a high performance, pure acrylic exterior painting system which offers outstanding protection for exterior surfaces. The product also offers unique protection against water, algal attack, dust pick-up, hairline crack bridging, efflorescence and extreme weather. 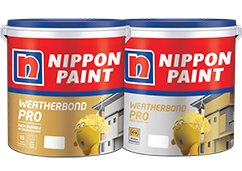 Weatherbond PRO base paint is an elastomeric paint with fibers which ensure high performance. Weatherbond PRO system provides effective waterproofing and anti-carbonation properties. 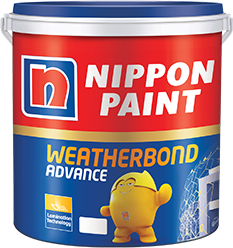 NIPPON PAINT WEATHERBOND ADVANCE is an all-weather protection exterior paint which possesses a unique lamination technology with silicone, providing twice the toughness and durability bringing about supreme protection against harsh weather conditions. 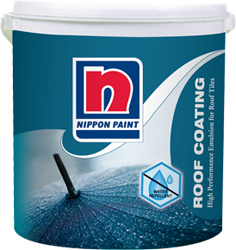 NIPPON PAINT ROOF COATING is an acrylic paint that is specially formulated for painting and re-painting asbestos and roof tiles. It is easy to apply and forms a smooth, tough, durable film with excellent sheen. It is also resistant to fungi/algae, water and dirt. 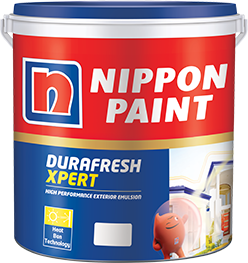 NIPPON PAINT DURAFRESH XPERT is a specially formulated high performance exterior emulsion paint with heat ban technology and silicon ideally suited for tropical weather conditions. It imparts a rich sheen finish and provides better anchoring and water repellency. It has anti-algal and dirt resistance to keep your walls look new for a longer time. 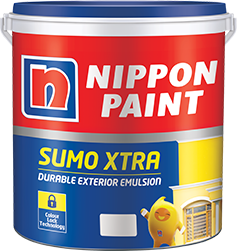 NIPPON PAINT SUMO XTRA is a specially formulated water based emulsion with color-lock technology which ensures that the colors look bright and clean. Its unique water resistant property keeps your exterior walls protected and there is no blistering or peeling of the paint film. 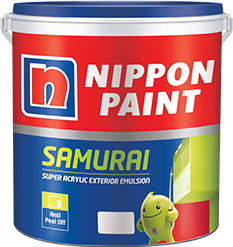 NIPPON PAINT SAMURAI is a specially formulated water based acrylic emulsion paint ideally suited for dry and moderately humid climatic conditions. It is anti-peel, anti-fungal and resists fading. It is durable and offers good hiding and spreading. The paint doesn’t peel off from the wall or flake, hence the walls look beautiful for longer periods. 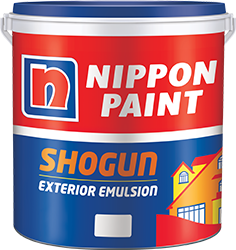 NIPPON PAINT SHOGUN is a specially formulated acrylic-modified based exterior emulsion paint suitable for exterior dry and less humid weather conditions. Its superior ingredients ensure that the exterior wall is protected from algal & fungal attack hence keeping it spotless for long.